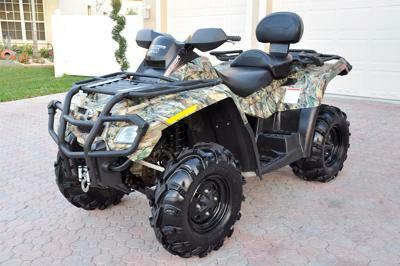 The 2008 BOMBADIER OUTLANDER MAX XT for SALE currently has 69 hours and 555 miles on it and the camo plastics are in mint condition with no scratches. The 4X4 is in very clean, excellent cosmetic and working condition. The 2008 Bombadier for sale has been well taken care of and garaged kept. The only added aftermarket accessories or parts on the ATV are the ITP Mud Lite 26" tires. You won't find a nicer 2008 Bombardier Outlander for sale on Craigslist or Ebay so hurry and make an offer before it gets away from you! Strike Lightning would also encourage bikers to submit a review of the 2008 BOMBADIER OUTLANDER MAX XT for SALE to make the biker community aware of any problems that are Commonly Associated with Bombardier ATVs or to highlight this 4X4's positive features and help potential buyers make informed decisions. The 2008 Bombardier ATV for sale is located in Miami Florida and if you would like more information and photos e-mail me using the comments form below (and don't forget to mention that you found this ad on Strike Lightning's Motorcycle Classifieds gogocycles.com) (and PLEASE do not neglect to include your contact information in your email or to provide a phone number or email address if you leave a message!) so that I can respond with answers to your questions or after consideration of your best offer as quickly as possible.